When looking for a magical Christmas moment this December, look no further than the Christmas Lighting Festival in Leavenworth, WA. 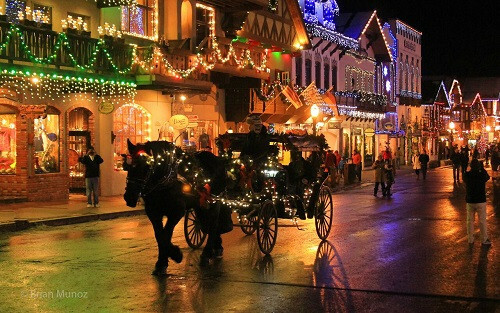 Nestled at the foot of the Cascade Mountains, the quaint Bavarian town already looks like something out of an idyllic painting, but for the first three weeks of the month, it pulls out all the stops to become a village of lights. What looks like every tree and building is completely decked out in both white and multicolored lights, illuminating the streets and reflecting off the glimmering snow, creating a truly magical experience. Add in the smell of crisp mountain air and roasting chestnuts, and one could easily imagine they’ve fallen into a Christmas card. The lights come on with pomp and circumstance on Saturdays and Sundays at 4:30 pm, but there’s plenty to enjoy even beforehand. 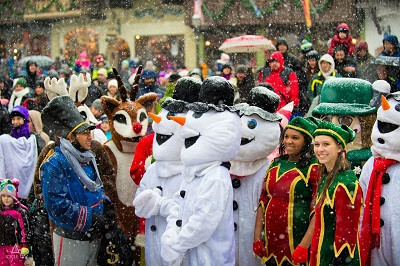 The festivities kick into gear at noon when Santa Claus comes to town, bringing along a band of assorted costumed holiday characters who march from the Festhalle to the Gazebo. Christmas pageants and musical performances can be found in the Front Street Gazebo, from handbell choirs to a top-ranking Army National Guard Dixie band. Traditional carols travel through the crisp air, adding a perfect touch to any of the town’s Christmas events. The Christmas Lighting Festival is especially enjoyable for the kids. On Sundays, they can gather free cookies with the Cookie Crawl Map, or meet Santa, Mrs. Claus, and Father Christmas and tell them what they want. 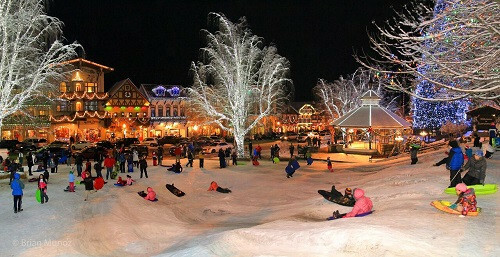 Ride on horse-drawn carriages and dogsleds, or sled on your own. “There’s a sledding hill right at the park so the kids are sledding first thing in the morning,” Stoller says. All of Leavenworth makes sure to get in on the action, too, embracing both the season and its German heritage. Vendors can be found around town selling hot chocolate and Glühwein, a traditional German spiced wine. When the lights come on St. Nikolaus arrives to tell the story of his legacy and gift good little girls and boys with “gold.” On Front Street, shop at Kris Kringl for hand-carved nativity sets and ornaments, then find the perfect Nutcracker to fight off the Mouse King at Nussknacker Haus. “It is our largest event next to Oktoberfest,” says Stoller. Large is an understatement, as after fifty-one years, the event has become a major tradition for travelers and locals alike. “We see upwards of 30,000 people,” she says. “We have whole generations of families that have come.” There’s even an official train that comes in from Seattle, bringing in hundreds of tourists anxious to partake in the festivities and see the town decked out with brilliant, twinkling lights. Though the Festival of Lights ends December 17th, the lights themselves remain through February, so anyone who wants to avoid the crowds but still feel the magic of the season won’t be left in the dark.